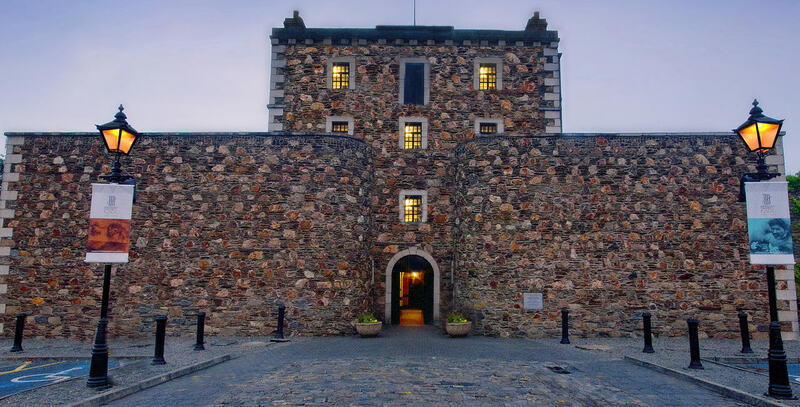 Wicklow’s Historic Gaol is fast-becoming one of the most iconic ‘must-visits’ on the trail of Ireland’s Ancient East. A major transformation of the visitor experience in 2014 saw the ancient prison become one of the country’s most high-tech virtual reality historic attractions. The project is designed to engage the senses and bring to life two of the most turbulent centuries of Irish history. Holographic projections of cruel prison guards, lifelike mannequins of major historic figures and state of the art audio-visual systems recreate the sounds of the defiant cries of the 1798 rebels, the famine era, the War of Independence and the Civil War. The replica two deck transportation ship, meanwhile, now features holographic interaction with the ship’s captain as visitors climb aboard the torturous 200-day journey to Van Diemen’s land. Iconic historic figures including Robert Erskine Childers (father of President Childers), Wicklow United Irishman Billy Byrne, the tragic female transportee Eliza Davis, Fr. Eoin McPhee – the first ever prisoner listed in the Gaol (arrested for saying a Rock Mass) – and many other unforgettable characters have entire cells dedicated to telling their story, with imposing life-size figures and captivating audio-visual interpretation. Elsewhere, the Jailer’s Rest Café and Bistro caters for all visitors with mouth-watering breakfast, lunch and dinner menus.